This books was first put on my radar for having three things I love: Russia, ballet, and separate yet intertwining stories. For some reason I cannot explain, I have a strange fascination with Russia. I've never been there, don't know any Russian people, or speak a word of the language, yet I am obsessed. As for ballet, I was a dancer until I was ten (when I lost all coordination and was extremely short and awkward), but I have still always loved ballet and the loveliness of it all. Combine all of this with one of my favorite literary techniques, and I've got a winner! 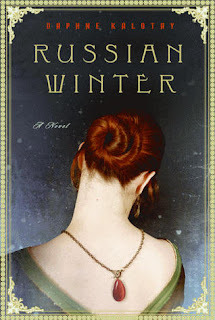 Russian Winter tells the story of Nina Revskya, a famous (though fictional) Russian ballet dancer in the 1950s. She has a fabulous career in one of Russia's most prestigious ballet companies and is married to a famous poet. However, she is becoming increasingly aware and uncomfortable in the Soviet lifestyle under Stalin's rule. When friends and family members are arrested or killed, and along with a personal tragedy, Nina makes a daring escape out of Russia and ends up settling in Boston. In the present, octogenarian Nina is in a tangle with a jeweler (Drew) and a Russian language professor (Grigori) who both have interest in jewelry that Nina brought over in her escape from Russia. All three of these character's pasts and futures play a part in each others' stories. I'll admit that I didn't care very much for Drew's story line; it was no where near as interesting or emotional as Nina or Grigori's, but it still added a nice touch. Overall, Russian Winter was fabulous. It took me about 50 pages or so to really get into the story, but once it picked up, it was hard to set the book down! Another note is the ending: it was SO abrupt. I turned the page, expecting more....and there was nothing. It wasn't a cliffhanger or anything...it was just very sudden and felt odd. Still, 4.5 stars to a beautiful and haunting story. I agree with your review: this book was pure, escapist pleasure and I just loved it. I really enjoyed this book too, the cover drew me in, but the words kept me there. I recommend Winter Garden, Kristen Hannah it's along the same lines, and equally as entertaining. I too have had a strange fascination with all things Russian for the longest time! Great review. Adding this to my TBR list! That cover is beautiful! I also have a fascination with Russia. And ballet. :D I am adding this too my list. I really loved this one too. I don't read a ton of historical fiction anymore, and can't remember the last one I read set in Russia, but I loved this one so much. I love Russia, and like you I have never been there nor do I speak the language. But there is something compelling about the country. I am really curious about this novel and I am glad you liked it. I will add it to my TBR. This book as been on my Wish List for awhile, so I am glad to see someone review it and enjoy it! I love Russia and all things Russian ~ I am a tiny bit Russian if you go back far enough, and I know a tiny bit of the language, but not enough to be practical. ;) I will definitely have to read this book, it sounds fantastic! I loved the history in this book-not something I knew much about but something I really appreciated learning. I love Russian and ballet books as well. I used to be a dancer and miss it a lot, and books that deal with it really bring back some great memories for me. This sounds really interesting, I love stories that have intertwining plots. Great review! This looks wonderful and the cover is stunning. Thank you! Surprise! This is magical. I really appreciate this post. I have been looking all over for this! I've had this on my shelf FOREVER...maybe this will inspire me to pick it up sooner than later...(well, since later has already come and gone!). Thanks for the review, it sounds like a great story. A must read for me now. Ballet + Russia? SIGN ME UP. I am absolutely fascinated by Russia - there's something I find magical about their culture. And I love that she's a ballerina! Love this cover so gorgeous! Intriguing concept as well! I have a copy of this book and I've been meaning to read it for forever. It sounds so good. I can't believe I haven't made time for it yet.